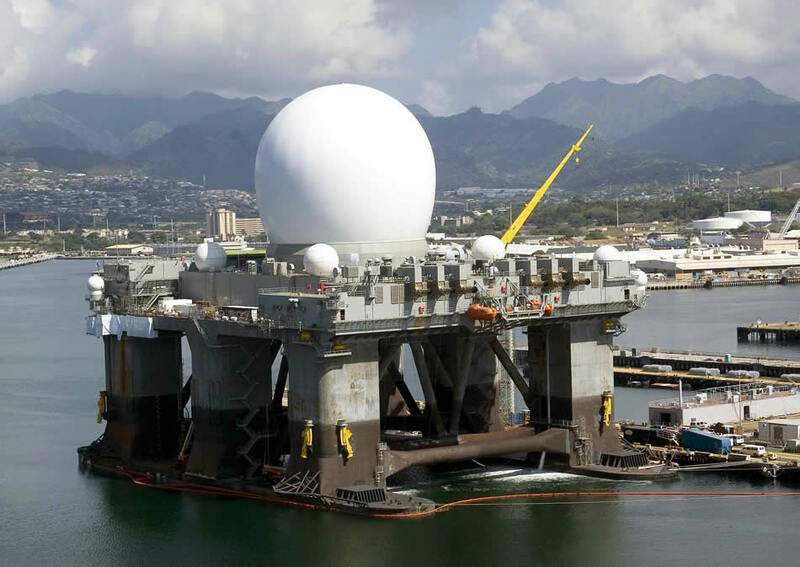 Boeing [NYSE: BA] announced today the arrival in Hawaii of the Sea-Based X-Band Radar (SBX) built for the U.S. Missile Defense Agency. This marks an interim stop in the vessel's transport operation, originating in the Gulf of Mexico and maneuvering through the Straits of Magellan, ultimately destined for Adak, Alaska. A major sensor for the Missile Defense Agency's ground-based midcourse defense program (GMD), the SBX will provide the capability to track ballistic missiles and their warheads, discriminate among various objects in flight, and provide data for intercepting targets and their destruction. The addition of the SBX to MDA's missile defense system is another key milestone toward the evolution of a layered and integrated Ballistic Missile Defense System (BMDS). "The arrival of SBX in the Pacific builds on the momentum of the GMD program, which recently conducted a successful flight test and installed its 10th operational interceptor missile at Fort Greely," said Pat Shanahan, Boeing Missile Defense Systems vice president and general manager. "The SBX is a one-of-a-kind platform that will perform essential sensing functions for the Ballistic Missile Defense System. It can be deployed worldwide; it can sense small objects thousands of miles away; it can provide critical data on incoming ballistic missile threats; and it is the only platform of its type in the world. No other platform within the BMDS provides all these attributes." Prior to its departure on its journey around South America through the Straits of Magellan, integration, assembly and test of the radar and platform were conducted at Corpus Christi, Texas. Following a series of sea trials, the SBX was transported into the Pacific Ocean aboard a commercial heavy transport vessel, the motor vessel Blue Marlin, which is owned and operated by Dockwise Shipping B.V. of Breda, The Netherlands. The radar will join other land and sea-based radars and space-based sensors, to support the overall ballistic missile defense capability, with initial integration into the command, control, communication and battle management system for the long-range interceptor missiles located in Alaska and California, improving their ability to defend against a limited long-range ballistic missile attack on the United States. Home-ported in Adak, a small island located in the Aleutian Island chain, the SBX will be able to move throughout the Pacific Ocean, or any of the world's oceans, in support of advanced missile defense testing and defensive operations. The SBX program team completed important milestones despite challenges throughout last year's intensive hurricane season. During scheduled program operations, the radar tracked orbiting satellites, which demonstrated key functionality. The program completed more than 100 test activities, demonstrating its ability to achieve major sustainment and operational capabilities, including: transferring personnel, supplies and fuel, performing at-sea maintenance and the ability to operate at sea for extended periods.